The most wrenching moment in Monteverdi’s opera “Il Ritorno d’Ulisse” (“The Return of Ulysses”), based on Homer, comes when we first meet Penelope, Ulysses’ wife. She has been waiting for what feels like an eternity for her husband to return from the Trojan War; she is unsure if he is even still alive. I can’t imagine a more musically and dramatically powerful rendering of this scene than at the performance of the work on Monday at the Gerald W. Lynch Theater at John Jay College of Criminal Justice, where the White Light Festival presented the Handspring Puppet Company’s production, directed by the artist William Kentridge. It has been 20 years since Ulysses sailed with the Greek army for Troy, and 10 years since the end of the war. Penelope has been courted by entitled suitors who want to marry her and claim the kingdom. Even her well-meaning nurse advises her to move on with life and marry. In this production, the mezzo-soprano Romina Basso sang Penelope’s scene poignantly, drawing out the grief and queenly dignity in the music. But, collaborating with an expert puppeteer, Ms. Basso also helped control a puppet Penelope, the real star. In a flowing red dress, her golden hair pulled back, the puppet’s fixed expression mixed sorrow and uncertainty. With simple gestures — turning her head, lifting her arms, lurching — the puppet conveyed Penelope’s torment and confusion. This production, first presented in 1998, trims Monteverdi’s nearly three-hour score down to 100 minutes, played without intermission. Five of the seven fine singers in this cast took multiple roles. The seven-instrument Ricercar Consort from Belgium, conducted by Philippe Pierlot (who also plays viola da gamba), performed with delicacy and refinement. 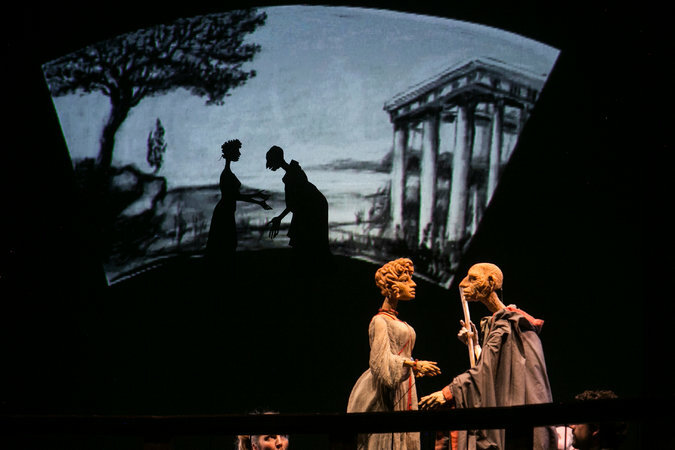 Mr. Kentridge, as is his way in directing opera, created a constantly varying backdrop of animations, drawings and films for the cast and puppets to play against. Images shifted from pastoral glades to urban waste, from ruined ancient cities to office buildings being demolished. As he writes in a director’s note, the opera’s prologue sets out a theme of “the human as vulnerable rather than heroic.” So, he folded medical footage, including angiograms, into the animations. It may sound like a hodgepodge, but somehow the myriad images got to the emotional core of the opera. The puppets stole the show. Ulysses, past his hero’s days, was a world-weary bearded figure with a tattered blanket for a robe. When, at the urging of Minerva, he disguised himself as a beggar to make his way back home, he encountered an endearing, gawky old shepherd, trusting by nature but a little out of it. Penelope’s three suitors looked like stuffy, aristocratic gentleman who could have attended the premiere of this opera in 17th-century Venice. The tenor Jeffrey Thompson brought an affecting blend of virile sound and bafflement to Ulysses. The other cast members also gave impressive performances, in partnership with the amazing puppets. 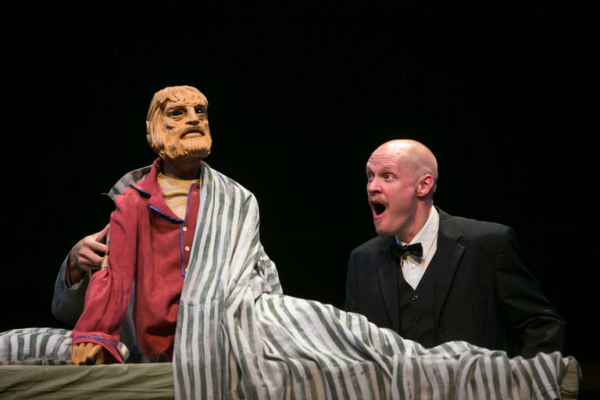 The final performance of “The Return of Ulysses” is on Wednesday at the Gerald W. Lynch Theater at John Jay College; 212-721-6500, whitelightfestival.org.